Believe it or not, this really is a Flying Elephant! The Flying Elephant is one of the classic attractions that has become a staple and fan favorite at every Amusement park around the world. This amazing aerial carousel-style ride is based on the 1941 animation film, ‘Dumbo’ by Walt Disney Productions. 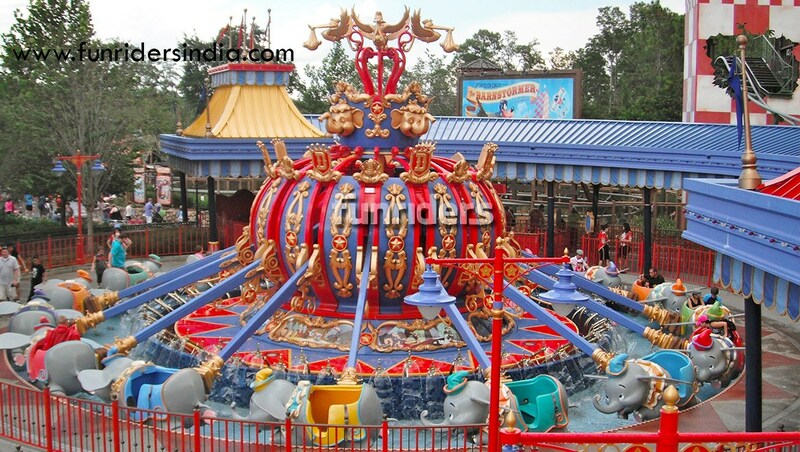 Inspired by the character ‘Dumbo’ the Flying Elephant, the ride resembles Dumbo which is mounted on articulated armatures connected to a rotating hub. The passengers ride in the "Dumbos" and can maneuver them up and down with a joystick that operates a hydraulic ram. The ride itself rotates counterclockwise at a constant rate. The center pillar is decorated with Empress Phoenix chariot, the distinct Red Lantern and other attractions. Certainly, the figures and decorations can also be added on to the installation as per the requirement. ► Swing Elephant has lively design of 8 elephants cabin with cute hats in different colors. In the center of pillar, lots of traditional Chinese elements are implanted in this ride, such as hanging decorations of Empress phoenix chariot, distinct Red Lantern etc.All makes it very attractive in any place. ► Through pneumatic control system, each elephant cabin can freely move up and down around the central arched pillars at one's own will by handle the switch on the cabin. ► Because of the lovely outlook and nice moving, make whole family enjoy a wonderful time together on the rides. Swing Elephant ride is a themed amusement park ride, popular in funfairs, theme parks, fairgrounds and carnivals. ► Flying Elephant has lively design of 8 elephants with cute hats in different colors. In the center of pillar, lots of traditional Chinese elements are implanted in this ride, such as hanging decorations of Empress phoenix chariot, distinct Red Lantern etc. All makes it very attractive in any place. ► Through pneumatic control system, each elephant cabin can freely move up and down around the central arched pillars at one's own will. ► As a spectacular family ride that everyone can enjoy together, the Elephant is a real crowd-pleaser.